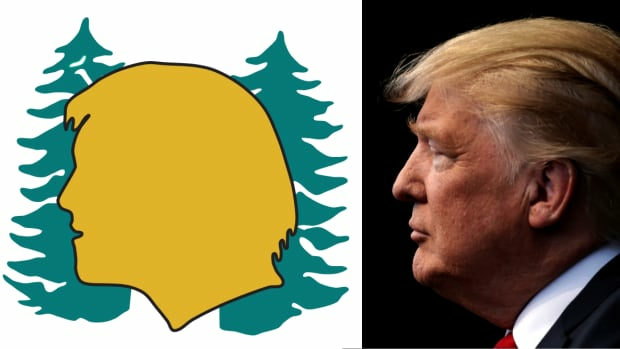 A lighter article about how the Yellowhead Highway logo (used on TCH 16 through BC, AB, SK, and MB; as well as BC 5) looks like Donald Trump. Some travellers along western Canada's Yellowhead Highway have noticed the route's logo bears a striking resemblance to U.S. President Donald Trump — and there's a good psychological reason behind it, according to experts. "It's freaky how much it really looks like him," said Winnipeg singer-songwriter Scott Nolan, who pointed out the similarities on social media. The logo depicts a yellow silhouette of a man's head, with a distinctive tuft of hair on top. Nolan was on tour with a friend when he noticed the resemblance. thank goodness it wasn't designated as the orangehead highway. Shared etymology from the Latin tradere "he hands over"
Interesting article but locked due to political abuse of comments.